Nvidia is gearing up to show the world it means business with its up and coming ground breaking new industry technology, yet again. It looks like the company, the first to bring us dual-core in a smartphone with the LG Optimus 2X overseas, then making its way to the US as the T-Mobile G2X, is at it again. 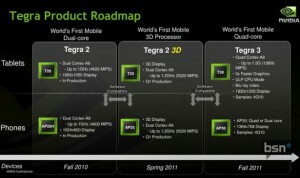 DigiTimes reported that Asus, makers of the Eee Pad Transformer have announced the production of the new Tegra 3 based tablet. One would imagine programs and navigation on a device like this would move at the speed of thought. The device will be built around the new Kal-El quad-core specifications and could arrive sometime in August of this year. When this Superman chip enabled device comes to light, users may just be laughing at what is now referred to as “1080p”. We’d imagine the device will put out a few more pixels than the average screen res. There’s no word as of yet on a release date for this monster but Nvidia does have a road map available regarding their chip set release, revealing quad-core for some time in August. Let us know what you think about having such a powerful CPU in a tablet. Or, are you sick and tired of the “Core Wars”?